Overview: Batak is a collective term used to identify a number of ethnic groups predominantly found in North Sumatra, Indonesia. Nias Island lies in the Indian Ocean about 125 kilometers west of North Sumatra. 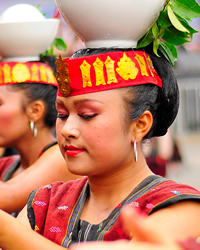 The Batak-Nias of Sumatra people cluster encompasses a dozen ethnic groups that inhabit North Sumatra and the islands of Nias and Batu.